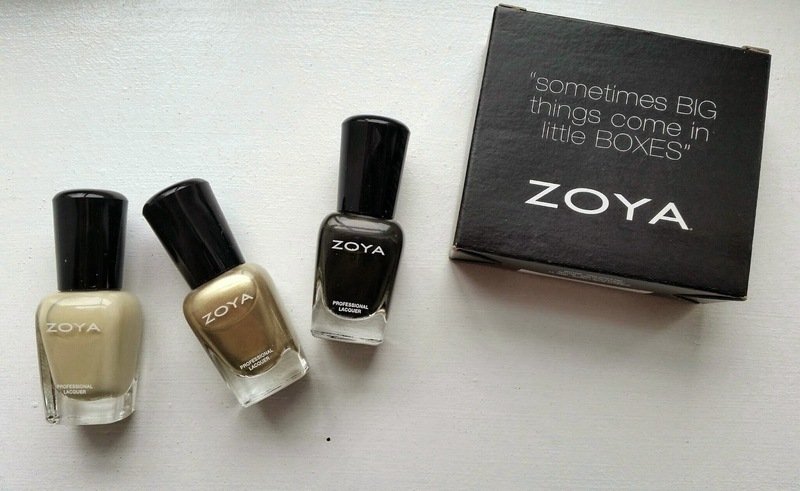 One of my favorite things about Zoya, aside from the truly insane color range and generally excellent formula, is the 3 free promotions they run a couple of times a year. While they do charge you shipping, it's still as if you're getting the polishes at a great discount, and the brand has a big enough selection that there's always something new to try if you're a polish junkie like me. As I mentioned on Monday, a few weeks ago Zoya ran another of these promotions, called New Year, New Hue. For $15 USD shipping and handling, you get to choose any three colors you want. Literally any of them, no restrictions, any finish you want. While this is $3 more than it has been in the past, this time the deal included a mystery mini trio, which is the second set of polishes you see above. Essentially, you're getting each mini for a dollar, whereas they usually sell on the site for $5 apiece, or $12 in a set of three. At the time of this post, none of the three minis in this trio were available for sale on the site. Since I was looking forward to spring when I made my choices, the set I chose definitely has a sort of spring garden-y bent. The palest pink is Madison, a translucent pale pink I'm hoping will look great with a traditional French manicure or on a less flashy nail day. The green is Neely; I got it because it reminds me a great deal of Essie's Absolutely Sure, an old favorite. I'm hoping it improves on the formula of that color, in addition to being slightly brighter. Last, we have Mia, an opaque creme dusty rose that I've given a test run and am very pleased with. The minis are, from left to right, Charlotte, Severine, and Anais. Charlotte is greige with a distinct yellow undertone that I fear may look a bit sickly against my skin tone. Severine appears to be a truly divine gold that's a cross between a shimmer and a metallic. Fingers crossed it doesn't show brushstrokes. Anais is a nearly black grey-brown with a slight silver shimmer. I'm eager to see if any of that reads on the nail, as this is not a color that I would normally have chosen and thus for which I have no dupes in my collection. Overall, I'm real pleased, and I can't wait to give them all a good try. Did any of you take advantage of this offer?